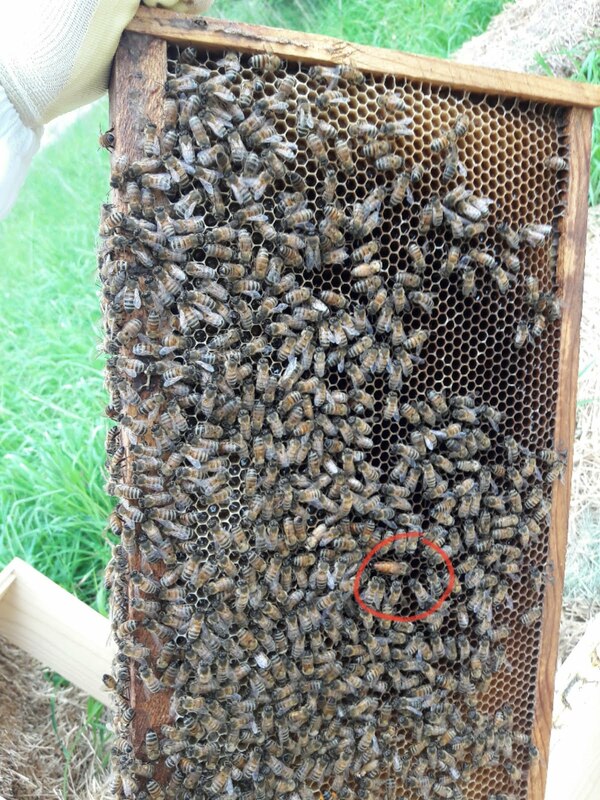 I checked out the hive over the weekend to see how the bees were progressing. They were doing well. 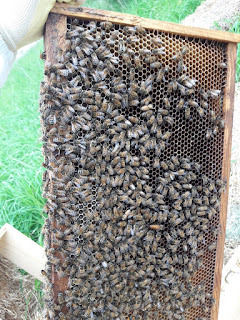 They had some more comb drawn out and lots of capped brood. Can you see the queen? I didn't actually see her until I was looking at the photos! I took these two photos to text to my nephew and while I was taking them I thought, I should take a picture of each frame and maybe later I could find the queen. There is a lot going on when you have the frame right in front of you. Your trying to be careful and not disturb the bees too much. I thought it was great that one of the photos I took had the queen in it. All the covered cells are capped brood. They are new bees waiting to emerge. I filled their sugar water to help them create wax to build out the comb. 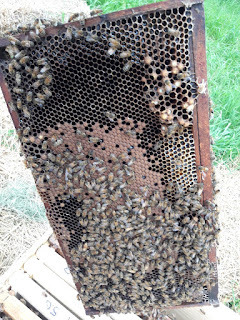 We have had a few rainy days so maybe they've been stuck in there with nothing to do but draw out comb! The chickens are doing well. 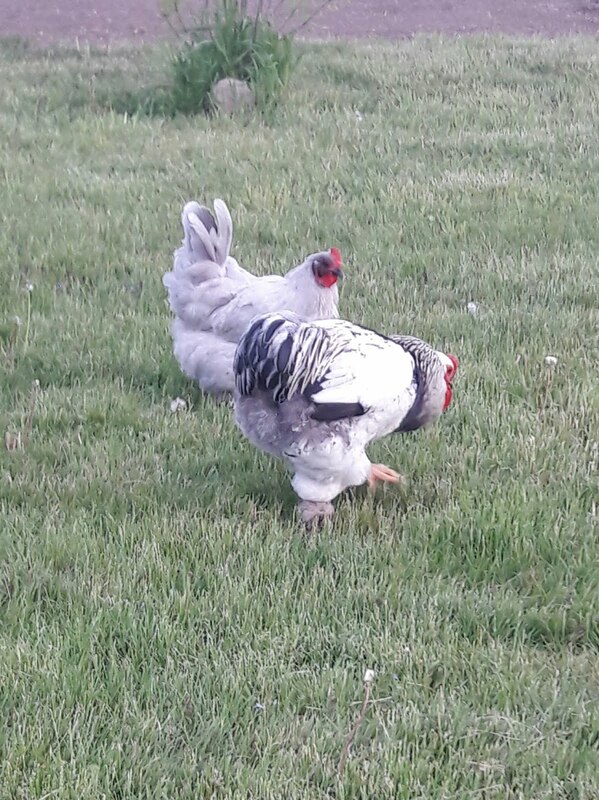 Here is Bert and Laverne in the yard. 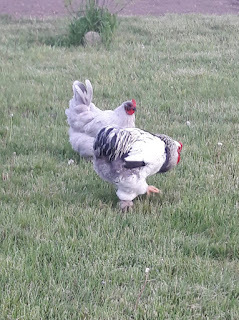 You can see Bert's saddle feathers drape over his tail stump. 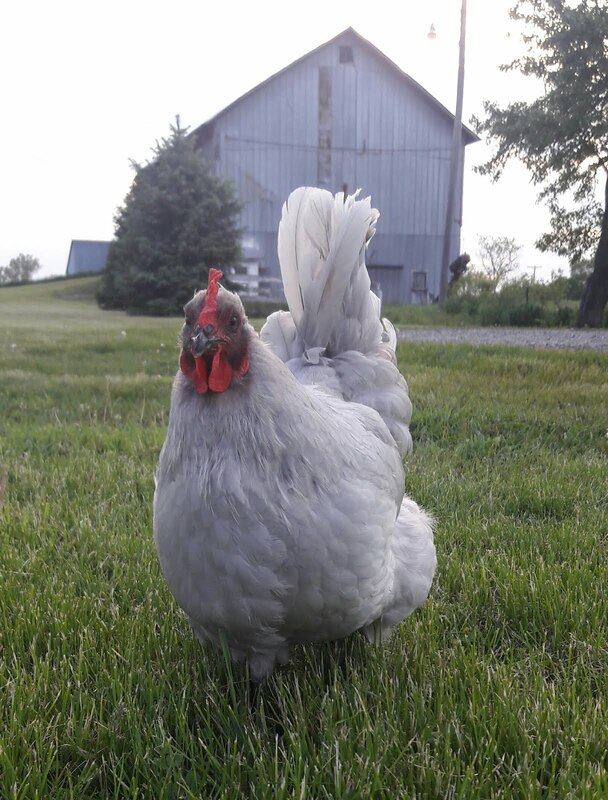 Laverne has been my big egg producer! Almost one everyday. Princess Diana is one every couple days and she still has problems with some of the shells not being firm enough, but she is getting better at it! Lucille is still sitting on the eggs I bought for her, and not laying any new ones. One did get crushed but the others are still being sat on. I tried to candle them but really didn't see much, I'm not sure if I'm doing it correctly or really what to look for so we will just wait until around the hatch date to see what happens. In case you couldn't find the queen, here she is.